Not All Those Who Wander Are Lost: Changes . . . .
. . . . All part of life aren't they? . . . . Looking at this picture takes me back in time. 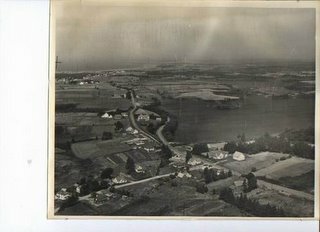 This was my childhood village as it was approximately fifty years ago. A photo taken of this exact spot now would show an entirely different scene. Some of these buildings would be gone . . . new ones would pop up in places where there are none in this photo. A silent testimony to the fact that things have changed; and they are still changing . . . . even as I type this. Few of the houses are home to people who I knew when I lived there. Most are strangers, as even rural villages lose that personal touch and become as smaller versions of big cities where no one knows their next door neighbour. To me that is so sad. I felt secure in that place, as it seemed to be an extension of my own smaller family unit. As society 'progesses' we are losing that . . . . at lightning speed. What do we lose as we 'progess?' Is the cost far higher than we realize? Accepting change has been difficult for me, and a part of me will probably always want to try and fight it, while I give in to the inevitable fact. I wrote the following back in January 2004. It's not a big word when you consider that it only has seven letters yet it's been one of the largest ones that I've ever had to deal with in my 50 years on this old earth. Some changes are good, some changes aren't so good, and some aren't worth another thought . . . . yet we can't get away from change . . . . . . it is continually happening. It happens to us directly and indirectly and it flows around us like the air flows around us each day . . . . . . and we can't stop it. There's no little button on the wall over there that we can run and press to hold life at a place where we're comfortable. So what must we do? Don't quit! Press on! Though we may not see it all clearly or understand why, we must continue on. The hardest part about change is the loss; a small memory obliterated by a fallen house, a landscape altered past recognition by a wide strip of pavement. Time is passing so fast, the generations that remember those quiet hamlets and how life was are leaving too soon.